Ernest Hemingway's classic novella "The Old Man and the Sea" recounts an epic battle between a fisherman and what may be the largest catch of his life. The monstrous fish he fights? A blue marlin. Sport fishermen consider hooking and landing a blue marlin one of the greatest achievements possible. Not only are blue marlins among the largest fish in the world, they're also notorious for putting up an incredible fight when hooked. Also known by the scientific name Makaira nigricans, the blue marlin is the largest of the billfish family. 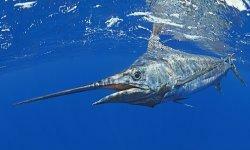 Its upper jaw forms a large spear-shaped bill, which the marlin uses to stun its prey. Blue on the dorsal side (the top) and silvery white on the ventral side (the abdomen), the blue marlin also has more than a dozen rows of blue spots on its body. Its tail is high and crescent-shaped. You won't find many fish bigger than the blue marlin. It can reach a length of more than 14 feet and weigh a whopping one ton. Female marlins are usually larger than the males. Blue marlins live in the deep, blue water of the ocean. However, they're known as "surface fish" because even though the water's deep, they prefer hanging around in the warm water near the surface. They're native to the Atlantic, Pacific and Indian Oceans. A highly migratory fish, blue marlins follow seasonal warm currents. You may spot a blue marlin anywhere from miles out in the ocean to close to the coast -- even near the Mississippi River at the Gulf of Mexico. That is, as long as the water is deep. Blue marlins also tend to be solitary and don't travel in schools. They feed during the day, usually on smaller fish -- such as tuna -- near the surface, but will dive deeper to eat squid. The Japanese use blue marlins for sashimi and fish them commercially. Blue marlins are famous -- or perhaps infamous -- for putting of a fight when fishermen try to land them. Because of their stubborn nature and their size, sport fishermen consider blue marlins the cream of the crop in game fish. The most common way to catch marlin is by trolling with a heavy-duty reel and tackle. Some anglers also use a harness for more support during the fight. You can attract marlin with either a lure or bait. Mackerel is common blue marlin bait. Once you hook a marlin, the battle begins. Blue marlins will leap into the air as they struggle -- an impressive sight -- but don't lose your concentration for even a second! Marine biologists don't yet consider the blue marlin endangered, but there's still concern that they're in peril of being overfished. Conservation is encouraged. Many anglers participate in a "tag and release" program, where they tag the giant fish after catching and photographing it and then release it back into the water. This way, the fisherman gets his or her trophy photo, and he or she aids researchers in learning more about the blue marlin's behaviors. Win-win!